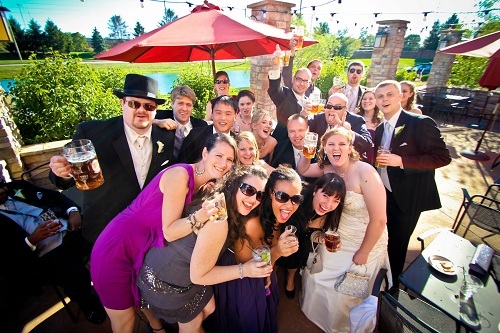 The wedding day was equally fun, with the bridal party making a pit stop at Rock Bottom Brewery after the ceremony. The reception was held in the pavilion at the Ritz Charles, which featured gorgeous bursts of color provided by Kathy’s Kloset, and DJ Jason Fritz had no trouble keeping this festive crowd on its toes through the remainder of the night. All of the good times were captured by photographers Jim & Lois Wyant, who kindly referred Abbey & A.J. to us. Leah & Justin were on top of the world (or Indiana, anyway) for their gorgeous ceremony & reception at D’Amore Indianapolis. Coverage started with preparations and a first meeting at the Hilton Garden Inn followed by photos around downtown with Jennifer Driscoll, who along with D’Amore referred this sweet couple to us. Then came the ceremony with the stunning skyline view, highlighted by readings consisting entirely of “chick flick” quotes. The reception was a feast for the senses courtesy of decor by Bokay Florist, service by Thomas Caterers of Distinction and music by The Impalas, along with a gorgeous sunset and a surprise golf-themed birthday cake for Leah’s dad thrown in for good measure. 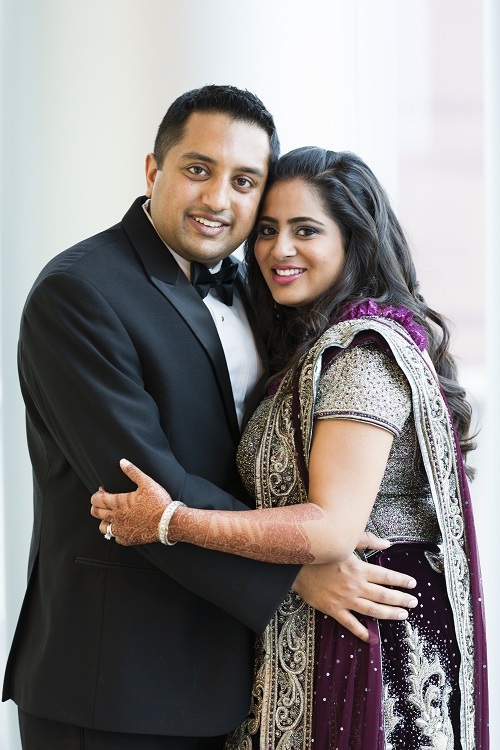 Gauravi & Amar pulled out all the stops and put on an Indian wedding extravaganza for the ages at the JW Marriott. Our coverage started with a Friday ceremony at Gauravi’s family home, followed by a fun sangeet party at the JW. After a Saturday break, we began 18 hours of filming with prep coverage alongside Nathaniel Edmunds Photography and former IndyVisual bride Jen Nair of Passionate Peacock Event Planning at 6am on Sunday. After a spirited baraat outside the hotel, the guests entered the White River Ballroom for the ceremony, where they were greeted by HMR Designs‘ jaw-dropping decor highlighted by three huge floral peacocks with endless orchid feathers. After the traditional ceremony and emotional vidai, Garrette & Amber joined the amazingness to help me capture the epic reception, including a surprise flash mob dance for the couple. By the end, all of us were exhausted but so happy to have worked for such a fun couple.